When one of your very good friends wholeheartedly recommends a book or series as one of her favorite contemporary romance series, you pay attention, yes? Which is why I didn't last long before picking up Laura Florand's The Chocolate Thief after Chachic brought it to my attention a couple of weeks ago. I don't know if I would have discovered Florand otherwise, and I am just really happy that I did because this book is delicious. That cute cover doesn't hurt it either. In fact, I am currently wallowing in reading purgatory waiting for a paperback copy of the second Amour et Chocolat novel to show up in my mailbox, because even though I could download the ebook in the blink of an eye, I just really need the cute matching covers on my shelf. This surprises none of you, I am sure. Make no mistake, though. The minute it does arrive, I am diving right in. Because this delightful little treat reads like a chocolate-drenched Anna and the French Kiss for adults. Are you telling me you want to miss that little slice of heaven? No. I didn't think so. Cade Corey has finally made it to Paris. Growing up the daughter of an American chocolate baron, she's dreamt her whole life of traveling to the city of lights and immersing herself in the world of chocolate masters. Now that she's here, she has a full-blown agenda. Track down Sylvain Marquis, make him an offer he can't refuse, and nail down a line of luxury chocolates to elevate Corey Chocolate's mainstream image. And Cade is absolutely sure she can do it. She's a savvy businesswoman who's spent her entire life surrounded by chocolate. She can have this deal in the bag by the end of the day and spend the rest of her unprecedented "time off" exploring Paris and soaking it all up. What she doesn't factor in is Sylvain Marquis' raging disdain for all things mundane. And Corey Chocolates are at the top of the list. The thought of putting his name on a Corey product fills him with actual physical pain. And so the battle of wills begins. Cade can't fathom giving up at this point. Not when she's come this far and invested so much of herself in this one dream. But Sylvain has traveled a long, difficult road himself. And he's not about to reduce all that hard work and mastery to a mere four-ounce bar of mediocre chocolate sold in Walmarts around the world. The divide between these two seems insurmountable. Until Cade has an idea, a dangerously game-changing idea. She looked at him as if he had hit her. Or, worse, stripped her naked in a pretense of seduction and then smirked and turned her around to see a thousand ridiculing eyes. She turned abruptly and strode toward the entryway. Without a word. Without letting him find out what that powerful force rising in her was. He found himself following, hoping she would say a word. He was kicking himself already. He hadn't really wanted her to leave. He just . . . thought it would be in his own best interest to make sure she did. "I believe you still have our coat, mademoiselle," he mentioned as she reached for the doorknob, trying to pry that word he wanted out of her. Her flush deepened furhter, her jaw as tense as it was possible for her to hold it. Her hands trembled so much on the buttons, she couldn't get them undone. "Tenez," he said, troubled, his own hands lifting. He was an idiot. There was more than one way to be an idiot, and he had just proven it. He had just cut off his own nose to spite his face. "May I help?" "Don't. You. Touch. Me." So much anger vibrated through her voice that he dropped his hands, that fourteen-year-old teenager waking in him, the kind girls didn't want to be touched by. So he stood there as she struggled with button after button, making her slow, miserable way down the coat, everyone watching them, her cheeks deeply red now. He wondered why she didn't just destroy it--rip it off, pop the buttons, drop it on the floor, and maybe drop a few bills on it to cover the damage as she stalked out. It seemed like something an American billionaire would do. At last she got it off, to reveal the most ridiculous enormous sweatshirt. He started to smile despite himself. "What are you wearing? Did you come to my workshop in your pajamas?" Americans. All the money in the world and not a gram of taste. She gave him a look like a slap, thrust the coat at him, and strode out. Passages like this are exactly why I loved The Chocolate Thief, for the effortless blend of light and dark with which Laura Florand crafted it. The protagonists are passionate about everything they do and love. And what they do and love is chocolate. This appreciation shines through in every heady, lingering description. This is a romance, to be sure. If you like yours dipped in the finest chocolate money can buy, then I suggest you seek it out immediately. The Adventures of an Intrepid Reader - "The city comes alive in this book." The Brazen Bookworm - "As charming as an Audrey Hepburn film and as drool-worthy as any "Top Chef" episode, The Chocolate Thief is a delicious novel that evokes Paris in every sentence." Chachic's Book Nook - "What I loved about these two characters is how passionate they both are about what they do." 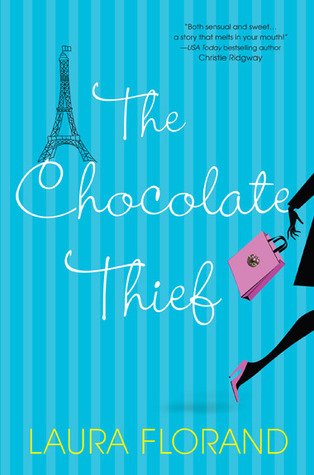 Dear Author - "The Chocolate Thief is a lovely confection of a contemporary romance." Romance Around the Corner - "Laura Florand is one of those authors whose books I really want to like, but never seem to work for me." Smexy Books - "I think the author captures the intimate process Sylvain goes through to make his chocolate quite well." Angie, you have no idea how happy it makes me that you enjoyed reading this! It's always a good thing when you can gush about a newly discovered series with your friends. I feel like I keep talking about Laura Florand the past few weeks but I can't help it. Her books are just filled with lovely words and the best kind of chocolate. She's worth talking about. Impatiently waiting for the second one to arrive . . .
Oh wow! "a chocolate drenched Anna and the French Kiss for adults" I MUST read this. I also must go and find some chocolate! Yeah. That was the feel I got for sure. I've been craving a nice box of chocolate myself ever since finishing it. It is definitely cute and I bought the second one to match because I like them so much. I'm really glad to hear you liked the second one, btw. Can't wait for it to get here! So glad you discovered this author too! I am in such love with Laura Florand's books - and agreed that they are light and cute but with unexpected depth. I think you'll like the CHOCOLATE KISS just as much, it's a little more magical-realism imo and that is always a good thing. I hear thanks are due to you for introducing Chachic (and then me) to Laura Florand. Thanks, lady! I loved this one, and am anxiously awaiting the CHOCOLATE KISS. Very reassured to hear you say you think I'll enjoy it just as much. Magical realism never lets me down. You introduced me to GARDEN SPELLS, and I shall always be grateful to you for that. Chachic's review got me to read this one, too! I'm reading the second as soon as I stock up on great chocolate. Yay for the Edge books! I love Rose and the boys. Declan's a good sort as well. He grows on you, blueblood princeliness and all. I really enjoyed this one, but unfortunately didn't like the second one as much - tried too hard with the magical realism for me! I was disappointed to see that they are repackaging these books as I really liked this look of the silhouette style covers and I thought that they stood out from other romances. Hm. Yeah, I've heard both things about the second one. The magical realism bothered some and worked for others. I'm about a third of the way in right now. So far so good, but we'll see. I'm with you on the covers. They stood out. I'll miss owning the others in matching silhouettes. *sigh* C'est la vie. Let me know how the third one treats you, Marg.